I still have that conversation on my chat, I look at it every day I get online and regret why I didn't go an extra mile to help him.... I keep telling myself that maybe if I had been less busy things would be different today; maybe that one day he sent a hello message but I was too busy to respond would have made a difference.... yes, now I know how it feels to be on the receiving end. You see, I only met him once on a cruise sometime in February 2009. I never saw him again but we kept in touch on social media i.e. he would post comments on stuff I put up on my facebook wall and that's it. But about three weeks ago, he raised me on chat for the first time after three years. Obviously I was surprised but something in me told me he needed to talk to someone and since it was around my lunch break and I wasn't planning on going out for lunch, I decided to find out what was eating him up. Well, the story he shared with me was sad, and I knew the only way to help him was by trying to avert his mind from his problems. And all was going well, or so I thought for the following reasons; on the 1st of October he was going to join a gym; I had managed to rekindle his hobby for reading and infact I had just shared with him a copy of my "Who moved my Cheese" e-book; the following weekend (6th Oct) he was to meet a close friend of mine who I was 100% sure would have helped him realize that he was not the only one going through a trying period. Him: "Wow i guess the journey of a thousand miles begins with a step. I thank God iam on the right track...."
Me: "It won't be easy but you'll be ok with time...hey, gotta rush... got a meeting somewhere in a few... Wishing you Peace. Him: "YEAH peace is the best thing to have"
Little did I know that those were the last words I would share with Tom Chomo Mboya. Well, all I have left now are questions... and regrets. He reached out to me on chat but I was too busy for him. Surprisingly, from the many posts on his Facebook wall, it seems like many other people were regretting the same way I was, for being too busy to listen to him. He put up a strong front for all of us and we thought he was ok, but little did we know he wasn't. If only we hadn't been too busy, then maybe between me and all the other people he tried to reach out to, we would have been able to pull him out of the abyss he was in. 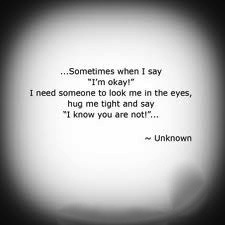 Life is not easy and sometimes each one of us needs someone who can be there for them, just listen to them; you may not have a solution to my problem, but maybe your being there and listening to me is all I may need to feel better. I did not share this message. Let's take time to listen to a friend this weekend - you never know, you might be the lifeline they needed to stay alive. Take time to appreciate someone right now, today, the next minute.... that might be the last time you are seeing them or hearing from them again in this lifetime. Tom is gone for good now, but not without leaving me with one major lesson; to be there when someone needs me. Be there for someone today, and let your words bring healing to them.